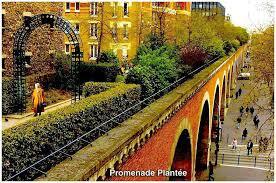 The green jewel of Paris is a beautifully planted, slow-paced walkway called “Promenade Plantée.” Once an abandoned railway line, it is the world’s first partially elevated park. Parisians (and those in-the-know) stroll past seasonally-changing cherry and chestnut trees, through long ‘halls’ of bamboo and by gem-colored perennials. The “green stream” runs for three miles from the Opéra Bastille to the Bois de Vincennes. Its elevated portion stretches between the Opéra and the Jardin de Reuilly. Then it goes to street level and passes through a few railway tunnels. Imagine your mind and your legs unwinding in this unforgettable place! This entry was posted in Uncategorized and tagged Avenue Daumesnil, Bastille, Bercy, Bois de Vincennes, Coulée Verte, elevated park, elevated walkway Viaduc des Arts, Gare de Lyon, green space, green stream, Jardin de Reuilly, local tourism, Opéra Bastille, Paris France, promenade, Promenade Plantée, rail line, railway tunnels, street level, strolling, tourism, viaduct, walking. Bookmark the permalink.